The next weekend arrived and my mum was down to visit. It’s fair to say she egged me on to get the man cave weather proof. It was a bit miserable outdoors and left to my own devices I can imagine leaving it wrapped up in a tarp and doing other things instead. She also leant a hand throughout the weekend and we ended up building the roof so fast that I forgot to take many WIP photos, especially at the early stages. Sheds are supposed to have a minimum 5 degree roof pitch to allow rain to run off them. To be on the safe side I designed the man cave with a 6 degree pitch. This also meant gaining an extra 5cm or so on the high side of the cave, which is not to be sniffed at. My other design choice was an extended soffit protruding over the door and window. This would serve triple duty of a) being somewhere to mount exterior lights for the garden b) preventing most rain getting to the front of the building, the doors and windows, and providing some cover while opening the door and c) looking quite nice. The first task was to notch all of the roof trusses where they meet the tops of the front and back walls. This is necessary because the roof is not flat, so the trusses would not sit flush on the walls without the angled notches. I used a saw to cut the edges of the notches, a stanley knife to scribe the slope then a chisel to knock out the notch. We could then screw roof trusses to the walls from above and cut and screw fascia boards to the trusses all around the shed. These boards in my case are 1″ x 4″ timber. 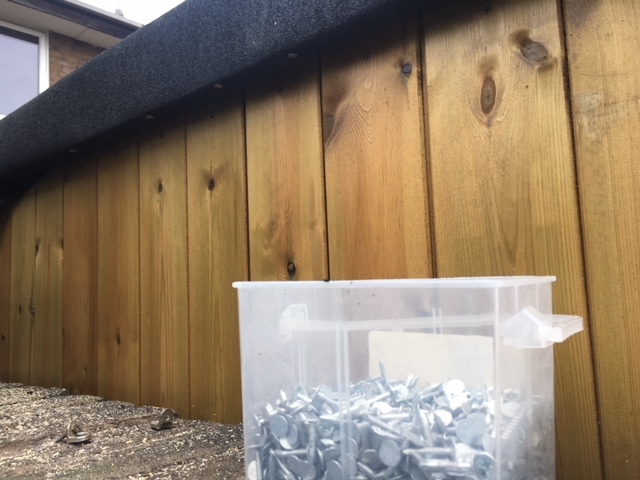 These ensure any rain run off drips well away from the roof and there should also be an air gap between the outer cladding and the fascias so water can’t run from the roof and down the walls. After cutting the OSB panels to size, we lifted them up and screwed them to the roof trusses, again from above. This means being on the roof, so ensure you’re putting your weight on the trusses and not the gaps! I used thicker OSB3 for the roof – 12mm instead of 9mm – mostly to give some resistance while clambering around on it. Here’s a good shot that shows the rafters, fascias and OSB. What looks like a gap between the two sheets of OSB on the roof is actually a strip of aluminium tape laid at the join of the OSB “just in case”. The floor is wet because my tarpaulins were failing, having developed large pools of rain water on top that then forced or found small holes to leak through. Good job I did go ahead and build the roof after all. Next we felted the roof. There are tonnes of roof covering options ranging from bog standard shed felt, to the felt I used which is thicker and tougher, to felt that is burnt into place with a blowtorch and then moving on to serious stuff like rubber membranes and other “proper” rooves. I suppose I went for the cheapest option that was easy to install and didn’t feel like a cop out. 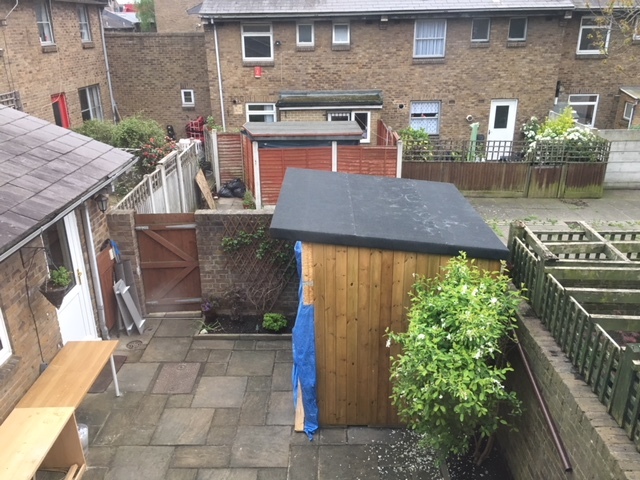 Shed felt is water proof and the heavy duty stuff I bought has a long life but unlike a “proper” building coating it will need to be replaced at some point. 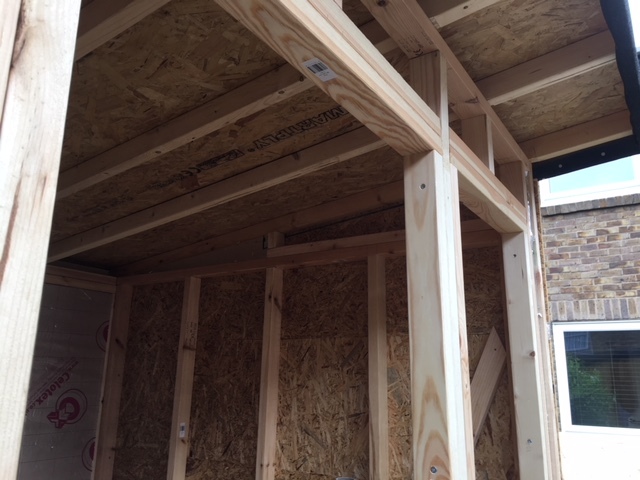 Here’s another useful photo that shows the 6 degree angle of the roof and why you would need to notch either the roof trusses or the walls themselves to make a flush join, and the extent of the soffit protruding over the front of the man cave. 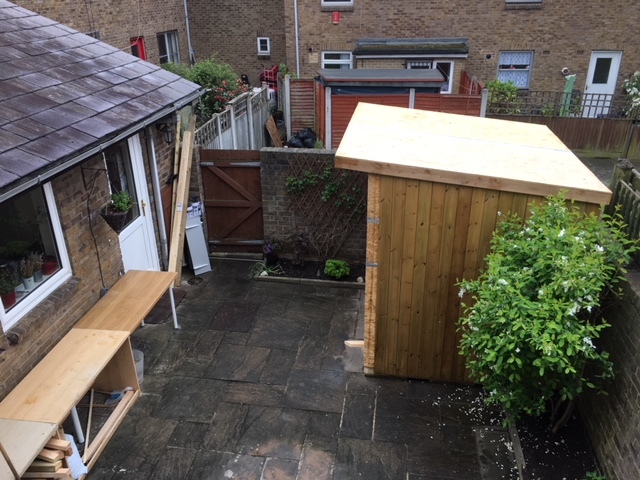 The view from above with shed felt complete. The tarp is up on the front again for the night. 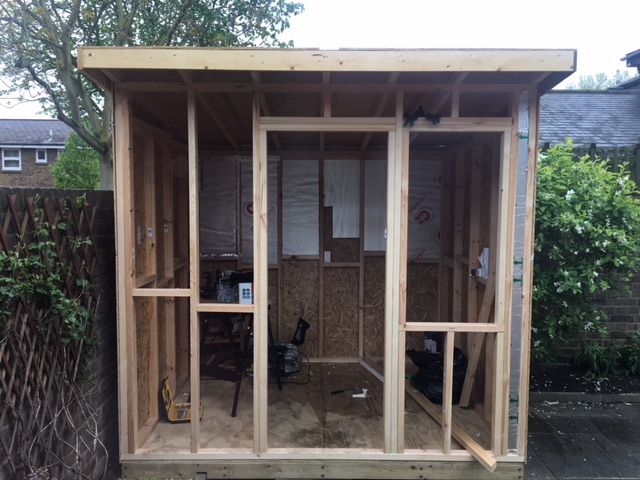 Tomorrow, time to skin the front wall and get the window and door in.